A friend asked me the other day for my thoughts on the Eric Garner GJ vote and I was at a loss. There are so many different ways to think about the vote, so many different issues, that it's hard, intellectually, to have a singular cohesive response. But on a gut level, it's staggering. Yes, I know it was Staten Island, but that's hardly an excuse. 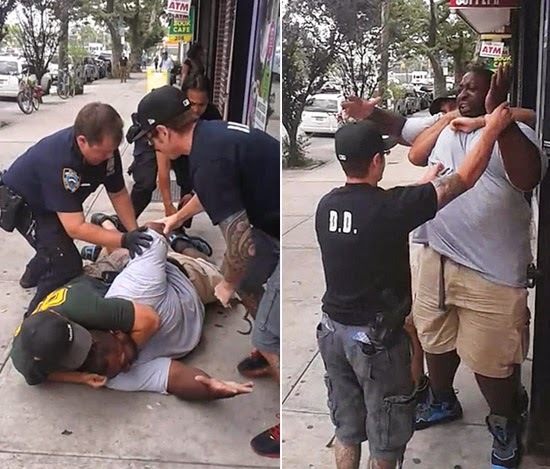 I am not sure what is more profoundly depressing: the fact that Eric Garner was needlessly choked out by a police officer on video (and then die from related injuries) only to have a grand jury say no crime was committed, or my initial assumption that the officer would skate on the charges. Regardless, these are the events that ought to compel a discussion of how we got here, and for white folks, myself included, to take a step back and acknowledge the legitimacy of black anger about the state of the union. On a micro level, meaning if you strip out race, both in terms of the individual officers' subjective perspective and in a broader, externalized sense, the criminal case against David Pantaleo was a mixed bag. Issues of intent and causation muddy up murder charges, and lesser charges would have been at least arguably defensible at a criminal trial where the state has to prove its case beyond a reasonable doubt. But Pantaleo's possible criminal culpability isn't really the point, not anymore than was Darren Wilson's. Juries, grand and petit, reach unexpected or outright unjustifiable results from time to time and nobody notices. Lawyers will be the first to tell you how unpredictable a panel of random people can be, and they sometimes reach unjust conclusions. No, it is not the minute details of the grand jury investigations into these two killings that matter quite so much as what the results symbolize. Which is to say, we are still just as racially divided a society as ever. It is a different divide than once was, but we are kidding ourselves if we pretend that we are an integrated or equal society. For me, the Garner decision highlights several points: (i) that it is incredibly difficult to prosecute officers for assaulting or hurting people, (ii) the reality of, and harm done by, the blue wall of silence, and far and away most importantly, (iii) that black lives are less valued than white lives. The last point has a kicker, which is that too many white people cannot or will not accept its undeniable truth. The difficulty in prosecuting police abuses results, at least in part, from the close relationship between officers and prosecutors. The vast majority of criminal prosecutions in NY begin with street arrests. The officers write up the cases and hand them off to prosecutors, who pursue the case based primarily on the work of the police. They prep the officers for the grand jury, pretrial hearings, and trial, and work with them throughout cases to shore up prosecutions and secure convictions. It's expecting too much to think these same prosecutors are going to tee off on their NYPD colleagues for using excessive force or making false statements to support an arrest. That prosecutors do not often pursue criminal cases against cops is self-evident. I am not talking about corrupt cops, those who are caught stealing or are busted in the middle of a crime (such as Phillip LeRoy, who was picked up in Florida while trying to buy 10 kilos of cocaine, which is an awful lot of cocaine). I am talking about cops who beat people up, cops who lie to prosecutors about why they arrested people, and then lie some more under oath. Those cops, the kind I would classify as "bad cops," are almost never prosecuted. I could talk at length about how civil litigation reveals clear evidence of officers using excessive force and making perjured statements to put innocent people in jail. No matter how much money the City of New York pays to settle these claims, or how many civil juries validate the truth of the allegations, none of it results in any punishment, much less criminal prosecutions. But, many people say, there are many good cops out there, far more than bad cops. This police bashing fails to acknowledge them and paints the many with a brush that should be reserved for the few. That is nonsense. Tolerating constitutional abuses by your colleagues is, as our local federal appellate court has noted, "unconscionable." Allowing beatings, false arrests, and the like, to go unabated, uninterrupted, and unreported is not being a good cop, if we use the term to mean an officer dedicated to serving and protecting the public and upholding the constitution. If, on the other hand, "good cop" simply means being a guy who has his partner's back and never snitches, then these good cops are every bit as worthless as the bad cops they are protecting and enabling. (H/t to Elie Mystal for his concise op/ed in the Daily News on this point). There has been no shortage of complaints about transparency and accountability, but it falls to the officers on the street and their immediate supervisors to put a stop to casual violence and perjury. For every David Pantaleo choking a man in order to make a misdemeanor arrest, there's handfuls of officers standing around doing nothing, reporting nothing, and saying nothing. These "good cops" may be honest, dedicated officers in the ordinary course of their jobs. But their silence regarding bad cops is acceptance, their silence is approval. I am tired of hearing about "good cops" when we are talking about cops who tolerate brutish and perjurious conduct by their brothers in blue. Finally, these events do not occur in a vacuum. There is no dispute that certain police activity is targeted primarily at black people. (For example, see here). Why this is so is a complex issue for another day. But, there is a long, long history of deeply embedded institutional and social racism throughout this country, and this makes an exploration of class, crime, and race tricky stuff. Many fellow white people I know see this as a historical artifact, as though racism ended when public schools were segregated. Sure, they'll concede, there's pockets of racism, but -- like bad cops -- it's the exception, not the norm. In a sense, the public acknowledgement that racism is socially unacceptable has driven overt bigots underground (who often resurface in discussions and comments following articles posted online and through anonymous posts in social media), and this rush to publicly denounce racism creates the illusion that we have reached a reasonable state of equality. But black people have every right to believe that our legal system provides different degrees of justice for different people, and that they are not and will not be treated fairly and equally. The deaths of Eric Garner and and Michael Brown were symbolic events because they reflected the reality of casual police violence towards young black men. The decisions not to criminally charge David Pantaleo and Darrin Wilson essentially endorsed that violence. I am not sure where this leaves us. The New York Times today has an article about how the Garner decision exposed existing racial divides. (Here). No kidding. We have lots of work to do, because where we are today ought to be unacceptable for all of us.